It’s almost Christmas and I am sure if you are hosting you are one busy bee preparing. 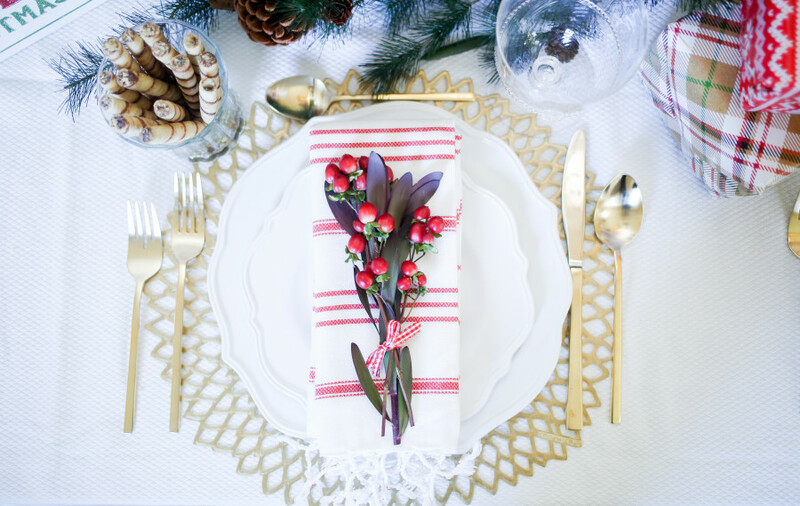 So today I wanted to share three fun, festive, and very easy ideas to incorporate into your table if you feel like it’s missing that finishing touch. Each tip is so sweet, it will surely bring a smile to guests’ faces! Starting with Tip Number One: Use gift card hang tags to tie your napkins rather than napkin rings! Tip Number Two: Place a small arrangement of huckleberries at each place setting for that added pop of color. How cute is this red plaid ribbon I found at my local craft store! Tip Number Three: Choose fun and festive salad plates and napkins. Here I chose both, a puppy plate from Pier 1 and an embroidered napkin that reads ‘Cheers’ from Turkish T! I love these ideas! Where did you get the huckleberries? hey Kate! I got them at a local flower shop. I have seen faux ones that at Pier 1!